36 hour Class (3 days) For RNs, LVN's & VN Graduates. California Health and Safety Code § 2547.3 (a) (36) CEU Course Approval Code #V10932 for LVNS only, CEUs approved by BVNPT. Book: IVTBW Participant Manual and Materials included in course. BVNPT: BVNPT Certificate Fee for LVNs or VNs (Effective 1/1/2019) [Add $20.00] I do not need a certificate from the BVNPT. This (36) hour course consisting of (27) hours of lecture and nine (9) hours of clinical experience. The course is designed to enable the Licensed Vocational Nurse to safety initiate and maintain intravenous therapy in the clinical setting. 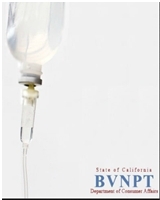 LVNs successfully completing the course will be certified by the California Board of Vocational Nursing and Psychiatric Technician Examiners to initiate and superimpose intravenous fluids and blood withdrawal. Course in intravenous and blood withdrawal is designed to teach participants basic techniques in intravenous therapy and blood withdrawal. NOTE: COURSE IS LIMITED TO ONLY FIFTEEN (15) PARTICIPANTS, TO ENSURE A SPOT IN THE COURSE REGISTER A MIN OF 60 DAYS IN ADVANCE. The IV Therapy/ Blood Withdrawal course is intended for recently graduated Vocational Nursing Students, LVNs for BVNPT state certification. All other healthcare professionals are welcome to take the course for experience only such as nurses, medical assistants, phlebotomists, patient care technicians, and other healthcare professionals. This course also serves as a preparatory class for those who wish to enroll in a phlebotomy technician class. LVNS: (Certified Course Requirements) For BVNPT state certification it is mandatory that each VN/LVN must complete a minimum of three (3) individually supervised successful venipunctures and three (3) individually supervised skin punctures (capillary blood withdrawal) on live human subjects. Recently graduated Vocational Nurses will not get a certificate of completion until they provide a LVN license number on record. Certificates will not be issued to students who fail to sucessfully complete all labratory practices. Participation in all class time is required (36) hours for IV Therapy BW Certificate /or (30) hours for IV only Certificate. All other Healthcare Professionals: for nurses, medical assistants, phlebotomists, patient care technicians, and other healthcare professionals looking to increase their knowledge and skills in IV Therapy and Blood Withdrawal. These individuals are NOT REQUIRED to perform the course final of successful venipunctures and skin punctures (optional only). However a certificate of completion will be provided indicating if they completed the final or if they where observers. There are no continuing education units for providers unless they are LVNs. Medical Assistants- The Venipuncture Blood Withdrawal Portion (10 hours) is required by most jobs, this consists of only Day 1 and Day 2. The BVNPT will (only) consider a licensed vocational nurse as competent to start and superimpose intravenous fluids via primary or secondary infusion lines and perform blood withdrawal who has completed this course. All other healthcare professionals WILL NOT BE CERTIFIED. IV Therapy & Bloodwithdrawal booklet with program inserts and supplies for skills and exam testing is Included in the course fee. This program combines two courses that will provide participants with training and certification in the techniques required to start and IV infusion as well as withdrawal of blood for testing. The IVT course provides information on fluid and electrolyte balance, puncture techniques, management and care of the site (both pre and post insertion), anatomy and physiology, and Universal Precautions. IV Therapy venipuncture skills include: site selection and preparation, equipment, order of draw and appropriate care after procedure. In addition, the Blood Withdrawal course teaches the techniques for blood withdrawal including selection of equipment, site selection and preparation, order of draw, and after-withdrawal care. Course in intravenous therapy/blood withdrawal meets the BVNPT minimum of (36) hours of instruction that includes 27 hours theory and nine (9) hours of clinical experience. BVNPT Approval: This program (2 courses) has been approved by the Board of Vocational Nursing and Psychiatric Technicians (BVNPT) for 36 Hours and is an approved CEU Provider by the BVNPT for this course a total of (36) continuing education units is provided to LVNs that complete the entire course. This is in compliance with California Health and Safety Code § 2547.3 (a). Identify the importance of infection control, the component aspects, and ho it impacts patient care. Perform 3 successful venipunctures on a live human subject for LVNs/RNs and 1 minumum for a Medical Assistant. IV Infustions Section (For LVNs/RNs) Identify the common parental solutions used in the clinical setting, identify the indications for intravenous therapy, identify the equipment necessary to initiate IV Therapy- primary and secondary, verbalize and identify the common complications local reactions. Successfully complete the written evaluation with 84% or greater. This course is open to California Licensed Vocational Nurses, graduates of a California BVNPT vocational nursing program, and Registered Nurses for remediation only. Only licensed LVNs will qualify for continuing education contact hours a total of (36). Pre-licensure VN graduates will receive a certificate once licensure is obtained and documented. Class is limited to 15 participants, Completion of all 36 hours is required to receive certificate. No partial credit will be given. A licensed vocational nurse must be certified by the Board to perform intravenous therapy or blood withdrawal. A licensed psychiatric technician can only be certified in blood withdrawal (not intravenous therapy). A PT must be certified by the Board to perform blood withdrawal. If a licensee is certified by the Board, the certification should show on the license. Course is approved through the California Board of Vocational Nurses and Psychiatric Technicians (BVNPT)? How do I become certified to perform IV/BW? There are two methods a licensee can become certified to perform IV/BW. The first is by completing a Board approved course in IV/BW. The second is by obtaining verification of competency by a California licensed physician or registered nurse. Approved IV/BW course providers are listed on the Board's website under "Education." Contact the Board at (916) 263-7800 or by email at bvnpt@dca.ca.gov for information regarding verification of competency for IV/BW certification. Why is my IV/BW certification not shown on my license? If the licensee completed a course before he/she was issued a license and the course provider submitted the completion certificate to the Board prior to licensure, the information may not have been matched with the license record. The licensee must contact the course provider and request that another completion certificate be sent to the Board ensuring that the license number is included in the correspondence. A replacement license showing certification will not be issued unless the licensee submits the required replacement application and fee. Employers may verify status by checking the online license verification system or call the board. Otherwise, the applicable post-licensure certification will appear on the license after the next renewal. Do I need to renew my IV/BW certification? No. Renewal of IV/BW certification is not required. Even if a licensee completes a new course in IV/BW and submits the information to the Board, the initial certification information will not be replaced. Can I use my IV/BW course for my continuing education requirements needed to renew my license? IV/BW courses can be used for the continuing education requirement only if the course provider is approved for continuing education by this Board or by the Board of Registered Nursing. If so, the provider must provide the licensee with a separate continuing education completion certificate which includes the provider's continuing education course approval number. IV/BW Certification Completed Out-of-State - Can I apply my IV/BW Certification to my California license? No. The Board does not recognize out-of-state certification for IV/BW. To be certified in California, a licensee must complete a California approved IV/BW course or obtain verification of competency from a California licensed physician or registered nurse. To qualify under the verification of competency method, a "Verification of Competency" form must be mailed directly to the physician or registered nurse for completion. IV/BW/CE Course Provider Renewal - Will I get a renewal application from the Board when my IV/BW/CE Course Provider Approval expires? Yes. Renewal notices are mailed to providers approximately 30 days prior to the expiration date. However, each provider is responsible for contacting the Board if the course approval is about to expire and a renewal application has not been received.